VCU Grad Endo Leaving Their Mark! The VCU endodontic residents have kept very busy in the graduate endodontic clinic this year providing endodontic care and support for patients from within the VCU dental clinics along with patients from the Richmond area. But did you know……………. 1. 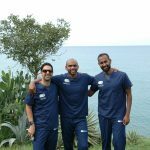 Two of our residents, Dr’s Cyrous Ardalan and Eshwar Arasu were selected by the AAE Foundation for Endodontics to travel abroad to Jamaica to provide endodontic care to the Jamaican people. 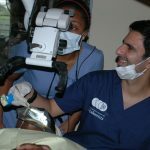 Traveling in October of this past fall, Dr’s Ardalan and Arasu met up with another mission team and provided endodontic care to many patients over the course of the week. With the use of a surgical microscope (loaned to the mission trip by Seiler), both residents provided a high level of care using modern equipment not typically seen in this part of the world. They were the second pair of endodontic residents to be selected by the Foundation for Endodontics in the Foundation’s new efforts at saving teeth in an area where extractions are frequently the treatment of choice. Both residents came away with a new perspective on how they might be able to use their skills to help others in impoverished areas of the world. 2. More recently, all eight of the endodontic residents attended the American Association of Endodontists annual meeting held in late April in New Orleans, Louisiana. Each of the residents made presentations during the poster clinics and table clinics at this meeting (3 research poster presentations and 3 table clinic presentations) and the table clinic presented by Dr’s Laura Garden and Megan Green placed in the top ten table clinic presentations thus winning an award and bringing some more recognition to VCU endodontics. Congrats to these two residents! The meeting provided some great speakers for the residents to listen to over the four day period and of course the evenings provided the opportunity for enjoying some good Cajun food and New Orleans style music. It provided a nice break from the rigors of a residency program. 3. What’s to come? In late May, Dr’s Husain Karashi and Eshwar Arasu will be traveling with myself to Guatemala City for a week where we will work with some Guatemalan endodontic residents providing surgical endodontic care at the Universidad Francisco Marroquin. This will be the first of what we hope to be an annual trip to provide our residents with an opportunity to increase their endodontic surgical experiences. Case information and radiographs will be shared ahead of time so that we can hit the ground running when we arrive. We will also have the opportunity to provide some lectures and discussions with our Guatemalan hosts during the week. This type of collaboration will help spread the dental care that is taught at VCU to our friends in need abroad. So that is a glimpse into some of what the endodontic residents have been up to over the past several months. 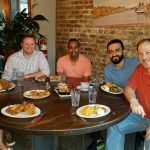 At the end of June we will see our second year residents graduate and they are headed in various directions – Dr. Arasu will be joining a practice in the Nashville, Tennessee area, Dr. Ardalan will be joining a practice in the New Orleans area, Dr. Riley Sturgill will be opening her own practice in Tennessee and Dr. Husain Karashi will continue on for another year here at VCU as an endodontic fellow faculty member. All four will do great as they head out on their own very shortly. The Department of Endodontics wishes the best of summers to you all!